How criminality slipped into an immigration debate? 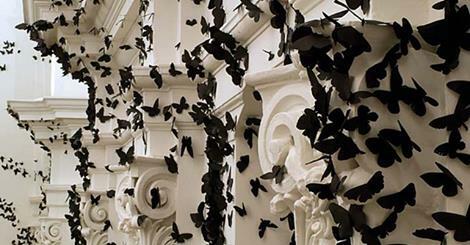 As in the picture, we could visualize the immigration debate as a white, clean building that become surprisingly invaded with black butterflies like this peculiar speech immigrants-criminals covered by concepts without knowledge and a distortion political speech that is far away to be realistic. I am really shocked about this tendency of introduce criminality in an immigration debate. Two complete different concepts mixed in irresponsible and poor academic content that create fear in times that societies need to feel strong and safer to be able to cope with a gradually more and more uncertain society. Nowadays financial shocks and climate change confirms the idea that societies needs stronger leadership and responsibility from decision makers to bring safety and hope for the people. Even if immigration movements exists throughout history, globalization brought a whole solid system based on free movement of capital and people under the idea that economies will growth better and stronger through this concept of society. It works. Millions of people around the world moving freely, searching for opportunities and building multicultural societies, contributing on the development of their own countries by delivering remittances, high studies or just living in other cultures and contributing with inspiring ideas, injecting fresh thoughts from foreign experiences. New York State, one of the top destinies of immigration registered a drop rate of criminality from 1990 to 2010 becoming one of the safest cities in the world, proportionally to a growing immigration legal and illegal. Is it true that there is a rate of crimes committed by immigrants, but it does not represent a higher rate of crimes in the whole picture. Multiculturalism enriches societies and do not necessary bring more criminality. New York is just another of many modern cities that serves as good examples of this reality. Crimes are part of our societies, and what is more, part of our human nature. Financial shocks, corruption and poverty push people to move forward to places that give them an opportunity to fulfil basic needs. Is it there the origin of the problem, is it there the root to attack: economic development, which makes countries, be in control of their own population by delivering basic needs of food, shelter and education. To stop uncontrollable movements of people is imperative to develop an effective diplomatic work with home countries. Millions of people over the world would be willing to stay in their own country if they have their basic needs fulfilled. Leadership and responsible political speech is a duty of policymakers to build open-minded people and societies. When a country is overwhelmed by immigration movements and is not able to insert them within their society, is it when criminality becomes the troubled way out. The healthy one is only possible to achieve by a fair regulation in which immigrants do not exceed the capacity of the host country. A multicultural global society is not just an asset but also the goal to enrich societies and boost individual freedom. Struggle against criminality is a matter of a different debate that involves both national and foreign people. The mix of both represents not just an academic mistake but also slows the path to move forward towards solutions that truly reduces world criminality. Defensive political attitude are expressions of fear and backwardness. We need to move forward and take responsibility of economic and political decisions that lead the world into a global context, in which definitely there is no room for old-fashioned nationalist approaches.